The new Musa comes in a broad, comprehensive range that caters for customers with very different tastes and requirements. There are five different interior outfits: Argento, Oro and Platino (the latter two available in two shades of warm or cold colours). Whatever the level of customisation, the new Musa is always fascinating and original, never losing sight of world famous Italian taste. The standard and optional equipment varies to some extent on the different markets. 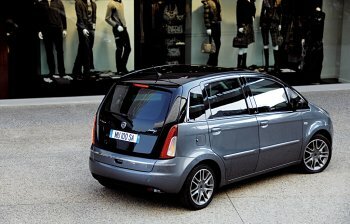 In general, the Argento version offers airbags for the driver and front passenger as standard equipment, with a manual climate system and wiring for a radio. Technical fabrics transform the passenger compartment into a pleasant living environment. The second specification level available on the Musa is known as Oro, and it adds 15” alloy wheels (depending on the market) with a new design, and exterior chromed trims on the side windows. 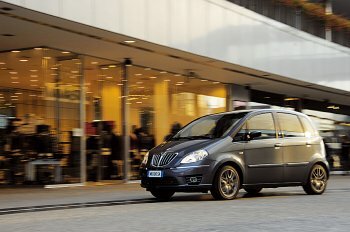 Other features of Oro include curtain-bags, three rear head-restraints, sliding, folding split rear seats and electric wing mirrors. The customer can also choose between two versions of the Oro specification, which differ for the fabric and shade of the interior upholstery: one offers technological ‘Airtex’ fabric with cold tones, while fashionable pinstriped fabric and warmer tones characterise the other. The new Musa Platino offers a lavish array of equipment ranging from the panoramic electric sunroof to a radio-CD player with steering wheel mounted controls. New 15” alloy wheels, Privacy tinted windows, a leather steering wheel and gear lever gaiter with contrasting stitching, foglights, a dual-zone climate system, ESP, sidebags and armrests on the front seats complete the generous array of equipment available. This specification also offers two interior environments that differ for the shade of the upholstery, with warm (leather/Alcantara® Starlite in two different shades, Chocolate and Turtledove), or cold tones (blue and grey leather/Alcantara® Starlite).